To spread awareness, Alzheimer's and Related Disorders Society of India (ARDSI), Mumbai Chapter organised "Awarathon Mumbai 2017" on Sunday at Worli Sea face, which saw participation from all strata of society, medical practitioners, caregiver, corporate people, NGO, volunteers. Currently, more than 41 lakh Indians suffer from dementia, the most common being Alzheimer's Disease, which causes gradual decrease in ability to remember and think clearly eventually affecting a person's daily functioning. This 3-km Awarathon was organised to create more public awareness. "This overwhelming response of participants to our Awarathon just shows that we are a sensitive society concerned about elders and senior citizens. ARDSI Mumbai Chapter, is striving to make our city of Mumbai a 'dementia-friendly city', with more awareness. We have received encouragement from Corporates and philanthropists to be a part of it. 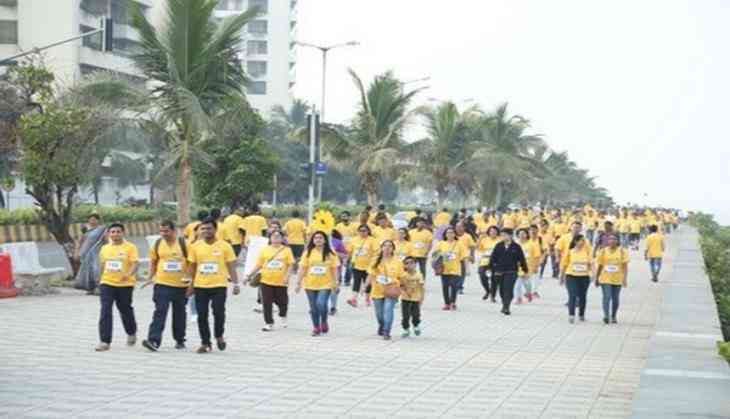 This event was possible only with the encouragement and support of Alkem Laboratories Limited, Police and Traffic Departments, BMC and of course all walkers present," said the Secretary of the ARDSI Mumbai Chapter. This event was supported by Alkem Laboratories Ltd, which runs a large social media community 'Dementia and Alzheimer's Community of India' and has launched an awareness video that is currently catching a lot of eyeballs. An official of Alkem Laboratories Ltd. said, "We are happy to partner with ARDSI, Mumbai Chapter and supporting their initiatives for this social cause as there is a real need to spread awareness and increase screening of Dementia. Due to social stigma, lack of awareness and that people often confuse forgetfulness associated as part of normal aging. Our social media initiative is a step ahead to spread awareness so that people can recognise symptoms early and avail of services of specialised Dementia DayCare Centre to help families lessen the onus of caring in their daily lives. Their counselling and support sessions help tremendously."